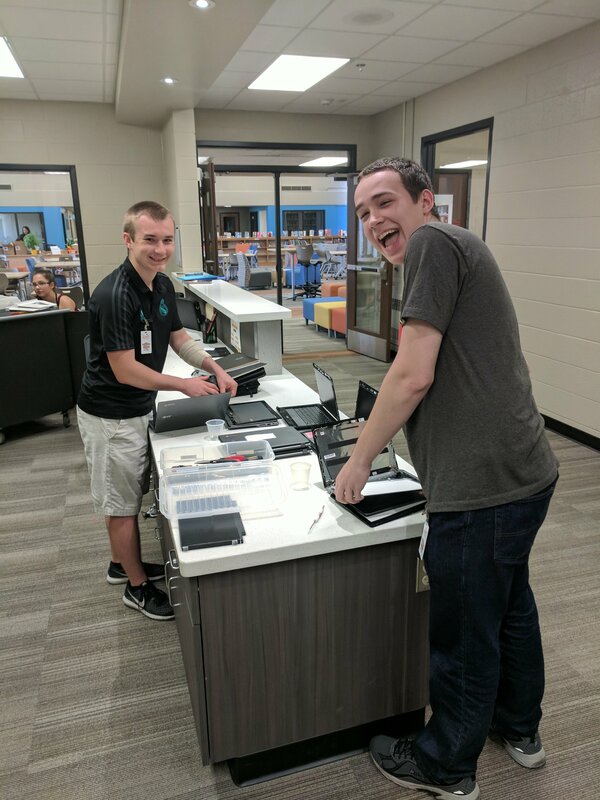 Although our district has been 1:1 for about eight years, this is the first year we have implemented a student led helpdesk. I’m not going to lie, at first I was dreading it, not because I didn’t believe in the idea or think it would be fantastic for students, but because I didn’t even know where to start or how to manage it. There are logistics to the helpdesk when it’s been led by students that are difficult to anticipate. I didn’t know what they were going to do all day. I didn’t know how they would interact with our tech department. I didn’t even know how we were going to take attendance since their assigned teacher wasn’t in the same spot as the physical helpdesk. It has been a project that has taken me a year to put together with researching other helpdesks, and calling up my teacher instincts and going with them. I’m proud with what we have put together so far, but as with every major implementation, will need to continue to adjust throughout the year. Where did you go to research? As per usual, I used my professional learning network to really connect and see what other people were doing. I had gotten some amazing information from the Director of Technology for the Leyden School District, Bryan Weinert. Their TSI system is a nationally recognized student led tech support program with pathways that the students choose and follow to support the skills that they want to focus on. As part of the program, Leyden pays for the students to get the certifications. Thanks to Bryan, I was able to get invaluable information on how they started their program and continue to make it a successful way for students to be involved in the technology department for both students and the district. I also loved this article by Jennifer Scheffer. I have borrowed many ideas of how they run their Genius Bar (as ours is called as well) and have implemented them. Basically, our Genius Bar is a combination of information from this article and the resources and information I received from Bryan. How did you recruit kids? Our Genius Bar is a class that is available every hour throughout the day. In our first semester, we have 16 kids who have taken the course. Realistically, some kids have taken it because they needed something to fill an hour in their schedule. Some have taken it because they wanted to try something different and had an interest in technology. Some are a part of the program because they had formed a relationship with our department and were excited to be a part of the Genius Bar. The most important thing we did was explain to teachers and the guidance counselors that the Genius Bar kids did NOT need to know a lot about technology. When I first told them this, they looked at me like I had lost my mind (a look that I feel I get a lot), but here’s my reasoning: if they have an interest but don’t think they know enough to be a part of the program, how are they ever going to learn if it’s something they really want to do or not? I made sure I erased “tech-savvy” out of our vocabulary. Might this change as the program becomes more popular? I have no idea, but I sure hope not. I want anyone to feel comfortable at any level coming to the Genius Bar, knowing they’re going to learn, not that they are only going to employ the skills they already have. This has hands-down been my best decision. When talking to one of the girls that now works the Genius Bar, she told me she doesn’t really know anything about technology and that she is not tech-savvy. The next day she was so insanely excited when we told her to YouTube how to change a Chromebook screen and handed her a broken one, and she did it on her first try (with the support of one of our tech services ladies). To me, THAT is the function of the Genius Bar. We want to open kids up to the possibility that technology might be an area they want to look at, and when we tell them they need to be tech savvy, we automatically exclude the population of kids that have an interest but don’t consider themselves to know a lot about tech. Canvas LMS Course: Our students have a course that they complete in Canvas that is a work in progress. They have access to the logistical parts of the course, video explanations with how to use the forms and what their expectations are. We use discussion boards to collaborate on projects as a team since the kids are scattered across seven class periods. There are also learning modules and assignments on concepts like customer service and creating a positive digital footprint. Blog: We have a helpdesk manager, which is a student that is a paid internship. This year, it is a student named Brock (an absolutely amazing person) who spent some of his free time last year helping me brainstorm and develop the Genius Bar, and he is in charge of various projects, and has both designed and will maintain and schedule blog posts that focus on technology integration for both students and faculty. Genius Bar students will be expected to contribute to the blog on a regular basis. 20% Time Project: Students will be creating goals based on what area of technology they would like to know more about. There are multiple ways they could design this project, but if the project requires the knowledge base of a certification to support that goal, the technology department will support them by paying for the certification. Project goals are monitored by myself and the assigned teacher, and the students will meet with us on a regular basis to update us on their progress and let us know if they need support in any way. Their 20% time project will also be documented in a portfolio on EduBlogs that they will be able to take with them when they graduate. Additional projects: The Genius Bar assistants are also in charge of additional projects that might come up as needed. For example, currently we found that third through fifth grade kiddos are not handling their Chromebooks with as much care as we would like. As our Kinder through second graders’ touchscreen Chromebooks are coming in soon, we are anticipating a similar issue. The Genius Bar kids have been asked to create videos for each level demonstrating the proper use of the devices. So far, they have been brainstorming if they would like to create cartoons or use the green screen, but they are in charge of producing the videos. The students always have a multitude of things to be working on. They will need to manage their time wisely, stay focused and organized. They also will need to collaborate with each other and our tech services department, as well as students and teachers that they may not know or necessarily have. They are treated as they an extension of our department. We have placed immediate trust in every student that works behind the desk, no matter what. Another decision that I think is imperative to the success of the students, and ultimately the Genius Bar. Moreover, as a director, I have been more removed from the classroom than any other position I’ve had in education. My focus has become the adults, and I do enjoy this because I know that I can affect student learning by supporting their amazing teachers. However, an unexpected side-effect from working with the kids from the Genius Bar has been remembering how incredible it is to work directly with students again. One day, I was sitting in my office, and I could hear them laughing while they worked. I literally stopped what I was doing and just listened. Working with the Genius Bar students has kept me focused on why I do what I do. I might be supporting their learning, and I hope that I have awakened or support a love for technology in the students like I have, but they are reminding me every day why I keep going when things get difficult, and why I love being in this profession so much. They do so much more for me on a daily basis than I could ever do for them. ← Adversity: Are you reacting like a leader?